The need for greater regional cooperation, collaboration and coordination of the growing CLE movement has been evident for some time. While multiple individual CLE programmes in many countries have developed, until recently, there was no official network with which to help guide and nurture this movement. This, in large part, through the support of the UNDP Asia-Pacific Regional office began to change and in November, 2013 SEACLEA was initiated at a regional CLE gathering in KhonKaen, Thailand. Following the initial SEACLEA inaugural meeting held in KhonKaen, Thailand on November 24th 2013, as well as the subsequent meeting held during the GAJE 7th Worldwide Conference at Jindal University in India on Dec 13th 2013, the following guiding principles have been adopted for the development and strengthening of SEACLEA. SEACLEA is a Southeast Asian Network of persons and institutions committed to improving the quality of legal education and achieving justice in-part through the use of Clinical Legal Education (CLE). It aims to bring together persons from different countries, whowill exchange perspectives and work collaboratively from a variety of legal, educational and organizational settings in order to increase the quality of law teaching and improve justice through CLE. Clinical Legal Education (CLE) is a rapidly growing form of legal education across much of Southeast Asia. It is widely accepted as a powerful pedagogical model which engages students and universities in the life of the community. By creating a network of persons and institutions who are committed to CLE, SEACLEA aims to support the growth and quality of CLE programmes in Southeast Asia through facilitating transnational information sharing, establishing and comparing models and standards of best practice, fostering CLE scholarship and research, convening conferences, workshops and training sessions, establishing a website as an open resource for information sharing and promoting collaboration between CLE programmes and legal professionals. 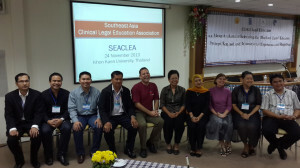 The general purpose of SEACLEA is to increase the quality of legal education and promote justice through the use of clinical legal education (CLE) by bringing together people involved in CLE initiatives throughout Southeast Asian countries, whowill exchange perspectives and work collaboratively from a variety of legal, educational and organisational settings. To pursue and promote access to justice and diversity as core values of the legal profession. Facilitating transnational information sharing and collaboration with regard to CLE, by providing in particular tools for sharing information on teaching methods, effective practices and materials among teachers, such as websites and databases. Fostering research on CLE and creating platforms for the sharing and exchange of relevant research products.Supporting and implementing advocacy projects at the local, national and Southeast Asian level in order to create greater awareness in Southeast Asia about the merits and advantages of CLE. Convening conferences, workshops and training sessions. Providing a platform for, and facilitating, transnational projects on innovative methods of legal education and the sensitization to access to justice through legal education. Training trainers in order to promote the creation of a pool of excellent clinical trainers in Southeast Asia. Facilitating transnational study visits and exchange programmes. Promoting collaboration between CLE programmes and legal professionals. This includes, among others, promoting initiatives that might improve the community understanding of the benefits of CLE, and establishing connections with professionals and legal professional associations in Southeast Asia. To date, SEACLEA has begun to achieve a number of these goals including the preliminary exchanges of law faculty, student and legal sector personnel. In order for SEACLEA to further achieve the above goals it has been recognized that some level of institutional, administrative support will be needed. SEACLEA has request that, during this early stage of development, BABSEA CLE assist in this capacity and provide both advisory and administrative support. Guided by SEACLEA’s mission and goals all activities referenced above will be done in coordination and collaboration between SEACLEA and BABSEA CLE. This will be done with the intent of having SEACLE take a prominent role in the future in the deepening and strengthening of clinical legal education throughout the region. Outcomes for each of the above components will constitute inputs into the next steps of SEACLEA’s ongoing development, capacity and self-sustainability. An evaluation, strategic planning process will occur whereby the outputs of this project are encapsulated into a visionary, next steps plan. This plan will be developed by members of the SEACLEA network and Steering Committee. These next steps will be used as a means to provide guidance into a larger programmatic regional initiative.